Such unique color, isn't it? Something between gold and green, depending on how the light reflects on it. It's going to be my favorite nailpolish for this winter, that's for sure. Πολύ ιδιαίτερο χρώμα, δεν είναι; Κάτι ανάμεσα σε χρυσό και πράσινο, ανάλογα με το πως αντικατοπτρίζεται το φως πάνω του. Θα είναι το αγαπημένο μου βερνίκι για τον χειμώνα, είναι σίγουρο. Poly omorfo to new layout.. Ax auto to berniki fainetai yperoxo apla! I got it yesterday and its really beautiful! 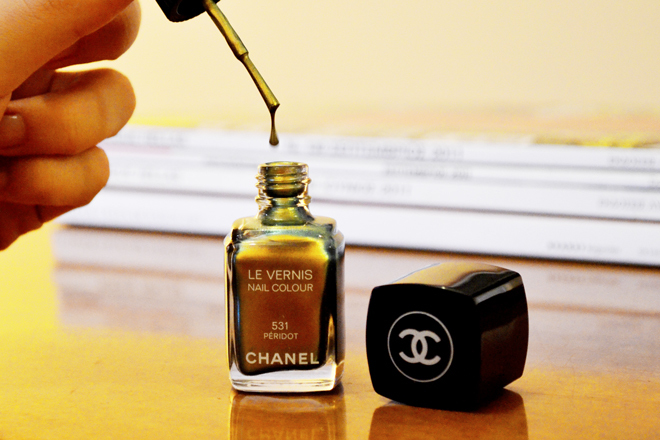 That is the best nail polish ever! Para poli wraio kai idiaitero to xrwma tou vernikiou! Megeia to new layout...Poli kalo! ohhh definitely !! Loved it !! I adore this color! So eye catching! Recently purchased that color, my god it is really something else. This color looks like liquid gold. Totally agree Kristina,it's indeed like liquid gold! So beautiful. this colour is amazing !! a combination of two of my favourite colours!! love it! I already love this nail polish and I've don't even tried it out yet!! Thanks for the sweet comments on my blog!! I'm following you via google friend connect and bloglovin! i follow you now....i'd be so happy if you would follow me back! Oh yes,it looks golden-metallize nailpolishes are going to be a huge trend this season and they are stunning,aren't they? I love Quartz too Vale,I want to have that one too! ohh woah that colour looks amazing. i may have to hunt it down and get some haha. i am going through a complete nailpolish obsession as of late.